Project Wonderful is an online ad platform that started out in 2006. Created by Ryan North, a webcomic writer, it quickly gained popularity among webcomic site owners as a user-friendly way of advertising their new creations. Since then, Project Wonderful has grown to be a popular ad marketplace over a range of creative niches. Here we list some of the most popular categories of websites that offer advertising space on Project Wonderful. If you happen to have a website in one of these areas, and want to try an alternative to Adsense or other ad platforms, Project Wonderful may offer a useful alternative. Note to publishers: Your site doesn’t necessarily have to fit into one of these niches to be successful, however if it does, then there is typically a larger pool of advertisers who are willing to compete with each other in bidding for your ad space. 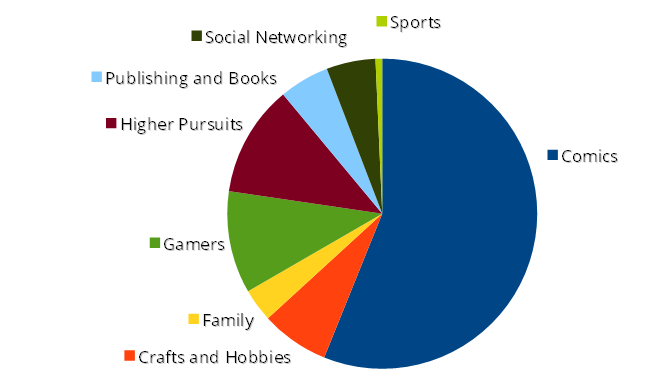 The strong representation of Comics and Gamers suggests a typically younger audience, with Crafts and Publishing/Writing expanding this out into wider interest groups who may also visits sites such as Etsy or Deviantart. Note that we’re not considering page views or unique visitors (or even websites) here, just the number of individual ad slots present (as of July 2014). Still, it should give a reasonable overview of what’s available. We’ve also edited the category groups here slightly from the defaults on the Project Wonderful search page to remove some overlaps, in particular removing the comics sub-category figures from “Gamers” and “Publishing & Books”. We’ve also left out the “Teens” category group since it covers many of the sub-categories. Here’s a more detailed look at some of the popular interest areas on Project Wonderful. All types of webcomics, anime, manga etc. (except explicitly adult without much creative content) both advertise and offer advertising space on Project Wondeful. Suffice to say, if you run a webcomic site, you should already know about it. A relatively new niche that has attracted a number of sites and advertisers is Minecraft. Sites are typically related to Minecraft server lists, guides, forums etc. If you run a Minecraft-related site or want to advertise on one, you should definitely consider using Project Wonderful. Apart from Minecraft, a number of gaming fan sites are here, covering a range of online and role-playing games, and virtual item markets for them (e.g. Team Fortress 2, Eve Online etc.) as well as some browser based games like PokeFarm. Unsurpsingly, given the vast number of webcomic sites here, other styles of creative writing are also popular, such as creepypasta.com, various categories of fan fiction, humour and more esoteric topics. There are a large number of smaller Art/Craft style sites on Project Wonderful. If you don’t want to individually search out sites to advertise on, you can use the campaign feature to target sites just in this category. After running a campaign for some time, you can then check to see if particular sites or ad placements are performing better than others, or leave the campaign to auto-optimize this for you. There are quite a few sites present that can not be easily categorised. Just a few examples are the social chatting app Omegle, a Boston bus and subway tracker and swap-bot, a parcel/gift swapping community. Use the Ad Search page to search for sites covering a particular subject or category. Note: If you’re looking for the top sites in terms of volume of users, it’s better to select “Unique Users” instead of “Page Views” on the search page. One of the great features of Project Wonderful is that you can always find a way to try a small amount of advertising for a low price, without a fixed minimum time or money commitment. This can make it a good platform to test effectiveness of different banner ad designs. You can even advertise for free for short periods of time, when the lowest bid price is set to $0 for a particular ad space. In fact, if you’re starting out as a publisher, it’s recommended to set your minimum bid price for each ad slot to $0. While this seems counter-intuitive in terms of maximising profits, what it does is give the Project Wonderful campaign algorithms a chance to evaluate your ad slot by placing various ads in it for short periods of time. If your ad space performs well, the system will most likely recognise this and the bid values for the space should go up over time. However if you set a minimum bid price too soon, you don’t give a chance for the campaign system to gain “confidence” in your ad slot, and progress may be slower as a result. For publishers, Project Wonderful doesn’t typically have many big-name advertisers bidding on your ad space, however if your site’s audience is a good fit in one or more of the above categories then you can expect to see some interesting and relevant ads. For advertisers there is the opportunity to target some very specialised sites that may not be easy to access otherwise. The user friendly interface, time-based auction and campaign settings makes it easy to compare different banner ad creatives for CTR and conversion rate. It’s worth mentioning that low-quality or spammy sites are rejected, so the platform isn’t overwhelmed with rubbish, which could easily be the case if there was no moderation. This quality control along with the time based auction system also helps prevent fraudulent activity. You can also run Project Wonderful ads at the same time (and on the same page) as Google Adsense without breaking the terms of service of either network. Have you found Project Wonderful to be a useful advertising resource for your website or ad campaign? Need some more hints & tips?